My sweet 7-year old has written a letter for Santa. It's ready to hand-deliver to the big guy next Sunday at the parade. I cracked open the envelope to see what she wants. Protip for kids: Even though you're writing Santa, let your parents see it before you seal the envelope. 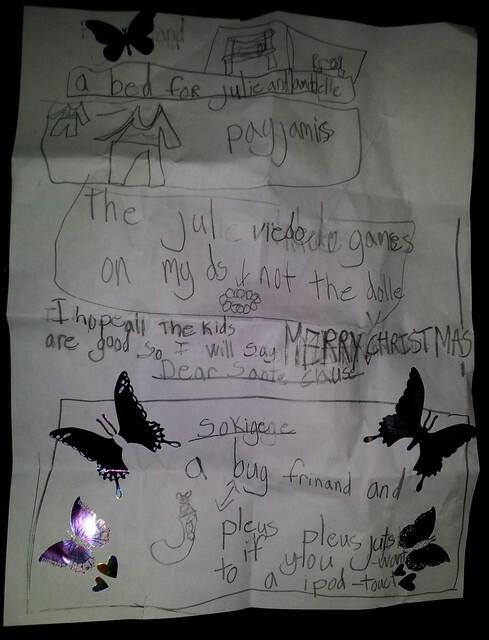 I think I've got part of it... she wants a bed for her two dolls, pajamas, some video game for her DS and a bug friend of some kind. Can anyone help me translate? Bed for the dolls Julie and Janelle(?). The Julie DS Video Games for the DS (not the Dolly). Hope other kids are good and Merry Christmas. Interlude for the "Dear Santa". A bug friend, and "plus, plus - just if you want to - an iPod Touch". This letter is pure awesomeness. Unless Mike is the real author, then I'm worried. The DS game she wants is American Girl: Julie Finds A Way. And yes, the iPod Touch as an afterthought... in case Santa is in a good mood... is pretty awesome. I can't read the letter. I can't translate it if I can't read it. It's graphical which my speech can't read. Go Habs. Hey Mike, Be careful I think it's a federal offense to open mail directed to someone else!! p.s. I thought you were the code guy that could decifer just about anything!!! I only speak kitty talk ... all they want is a couple of squeaky toys. Hey Mike - this is pure awesomeness! I just love this letter. You guys have obviously raised your children well. I hope Santa hangs on to this one. I think it says "please, please" and not "plus, plus". Her spelling is too good to make a mistake on a "plus", and she has probaby seen "please" written at school, and just can't recall it exactly.